This recipe is a good source of natural carbs and fat, but a little light on protein. You might want to top it with Greek yogurt, cottage cheese, tofu, or shrimp. Other great protein sources you could add are grilled chicken, steak, black beans, and quinoa. 1. Heat 3 tablespoons oil in a large pot over medium heat. Add shallots and celery; cook, stirring occasionally, until tender, about 3 minutes. Add 4 cups each shiitakes and baby bellas, sherry and garlic; cook, stirring occasionally, until the mushrooms are soft and the liquid has evaporated, about 5 minutes. 2. Stir in potatoes; cook for 1 minute. Add broth and water. Bring to a boil. Reduce heat to maintain a simmer and cook, stirring occasionally, until the vegetables are very soft, about 20 minutes. 3. Meanwhile, coarsely chop the remaining 2 cups mushrooms. Heat the remaining 1 tablespoon oil in a medium skillet over medium heat. Add the mushrooms and cook, stirring often, until soft, about 2 minutes. Add walnuts and salt. Cook, stirring occasionally, until hot, about 1 minute more. 4. Puree the soup with an immersion blender or in a regular blender (in batches, if necessary) until very smooth. (Use caution when blending hot liquids.) Stir in vinegar and pepper. 5. 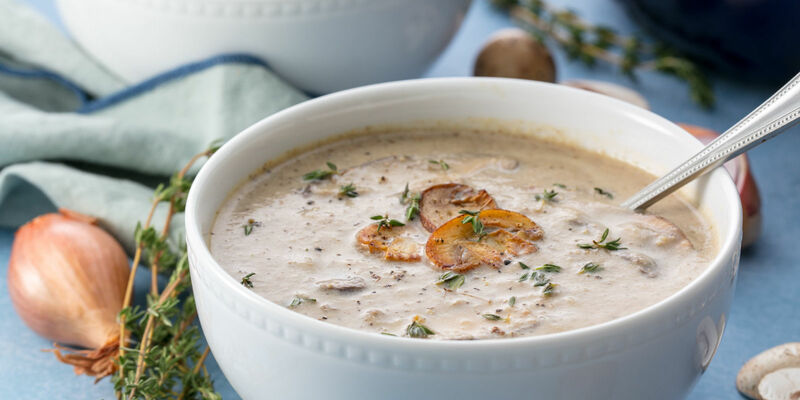 Serve the soup topped with the mushroom-walnut mixture and chives.